According to report after being hailed for spearheading the fight against fake news in Telangana, Jogulamba Gadwal SP Rama Rajeshwari is again in the news again for all the right reasons. In a unique initiative, she has decided that violators of traffic rules should plant a sapling. This move is also a push for the Telangana ku Haritha Haram campaign, under which the state is attempting to maintain 24% of its green cover. “We decided to involve traffic law violators with the thought that if we are to check crime and it spreads, there should be improvement both in our preventive and remedial efforts,” Rama Rajeshwari told TNM. As part of creating awareness on road safety, the Telangana government has also put up booths on the Jogulamba Gadwal highways, where cops can keep an eye out on citizens who break road rules. The state has created avenues and allotted lands where violators would plant tree saplings after paying the stipulated fine amount. “The Gadwal district police aim to plant 2 lakhs saplings in all police stations, residential quarters, training facilities and district police office complexes. Each police unit is given a target to involve citizens in the planting activity. 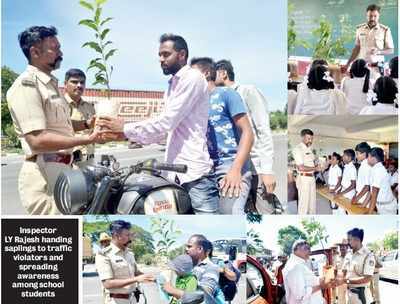 Not just traffic law violators, our program also reaches out to history sheeters and ex-convicts who will join the police teams to plant saplings,” the officer says. In 2016, Rama Rajeshwari got 68 history sheeters to plant trees along with police officers as part of the Haritha Haram program in Malkajgiri.